When you trade you have to deal with two risks. One is the risk of trading in general and the other is the specific risk of the trade you are thinking about at that moment. 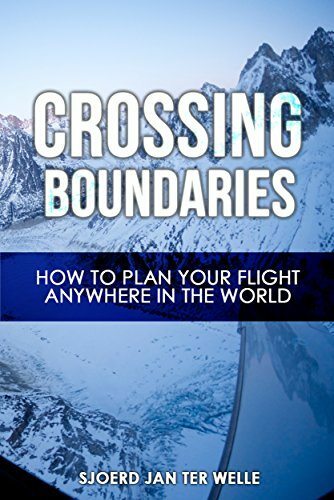 The first risk is quite easy to manage by setting for yourself a limit and some rules on the risk you want to run in general while trading your account and then to only place orders protected by a stop-loss within the boundaries and limites you have defined for yourselves. The second risk mentioned is to quantify the risk of each specific order you are about to place in the market. That trade by itself can be quantified as being one where all the ‘signals’ are on green and thus the trade is perceived as a low risk potential trade or one where you are less certain of your odds and thus a potential trade with more risk associated with it. Quantifying the risk on the trade itself is more art than science and it takes time to develop a good feeling for it. Setting trading overall trading rules in general is quite simple to do. Most brokers offer you a leverage where you cannot only trade with your own money, but also with money from the broker. It is in a way a loan given to you by the broker so that you can magnify your trading profits. It can just as well also work against you where losses are magnified as well. Some brokers offer outrageous leverages such as 1:200 or even higher. It is better to limit your leverage to lower ratios. Margin is in effect the deposit or money you place in your account with your broker, also referred to ‘initial margin’. So, where leverage refers to the loan element on the brokers contract with you and refers to the money the broker gives you as a loan to trade with, the margin is the money you put yourself into your account. Here is an example. Lets assume we get a leverage of 1:100, so we deposit 1.000 euro into our account and now you can trade for 1.000 x 100 = 100.000 euro. The leverage can elevate your wins and losses. That is the power of leverage. The danger is that a small move in the wrong direction can also leverage the potential losses. Your broker is not going to be the one running the risks for you with your trading activities, so when you open positions, you use some of the initial margin, where your broker offers some of its money to leverage and thus fund the positions. Now the open positions start moving between profit and loss second by second as long as the positions are still in the market. If your trades are loosing too much, your margin might not be enough to cover your open positions and the broker might call you to add funds or automatically close your open positions for you at a loss. This trigger is called a maintenance margin. Maintenance margin is the amount of margin that your broker requires to be in your account at all times in order for you to continue trading. If your open orders show a loss, it could result in your margin falling below this level. In such a situation, the open orders will be closed automatically by the broker or in the old days they would call you to ask you to fund your account with extra money. They do this in order to protect you, but also not to run the trading risk themselves as a broker. There is more to this whole equation, but what I wanted to point out is that it is essential to manage your account well. You should never ever receive a margin call as then your trading has already become out of control. Lets take the EURUSD currency pair as an example. A LOT in this case is 100.000 euro against the dollar, 10.000 euro is associated with a MINI LOT and 1.000 euro against the dollar is called a MICRO LOT. You can buy or sell one mor more LOTS or often, not always, one or several MINI or MICRO LOTS. A lot represents 10 dollar per pip. A mini-lot 1 dollar per pip and a micro-lot 10 cents per pip. So when we buy or sell one mini lot on the EURUSD pair, we know we are buying or selling in a 10.000 unit size, and therefore each pip movement with then be equal to one dollar. If we set our stop-loss at 50 pips away from the current market price, then we know that our maximum loss in this case is 50 x $1 = $50 on that specific trade. What I notice is that a lot of traders just place orders in sizes of equal lots, mini-lots or micro-lots or multiples thereof. The do place a stop-loss, if they don’t forget, but do not calculate the exact risk percentage per trade let alone manage the overall outstanding risk on all open positions. After all, it does take some effort to calculate the risks correctly and to keep track of it all. And it is here that a trade management application can help out. 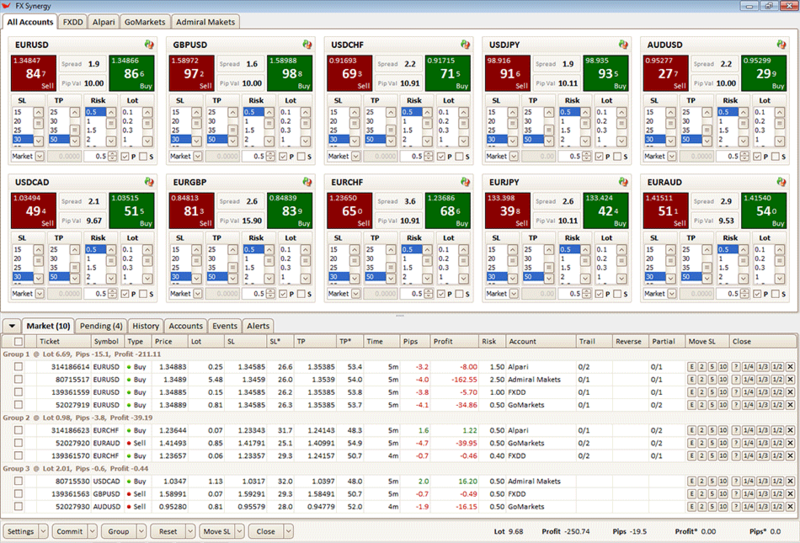 Sample FX Synergy trade management screen. FX Synergy is a trade management application that I personally use to help me manage my trades and their associated risks. It helps me to more easily quantify the risk per trade percentage-wise and it does all the calculations for me to make sure my orders are of the correct lot, mini-lot, micro-lot or multiples thereof size. You still have to be alert in that some products offered by brokers can only be traded in full lot sizes. One example is for example the EFTs (Exchange Traded Equity Funds) offered by Pepperstone. They are only offered in full lot sizes, while currencies and other commodities like Gold and Oil can be traded in multiples of micro-lots and mini-lots as well. So you need to stay alert. Alternatively, you can calculate the risk per trade by using a risk calculator. These are offered in several Excel variants and also as e.g. smartphone apps. However, it takes extra discipline to first calculate the risk using such a standalone calculator to then manually transfer the calculation results into your trading software to open the position. With FX Synergy, the FX Synergy application will place the order for you with your broker on the spot and can even manage placing orders in multiple accounts all with their own respective risk management percentages taken into account. 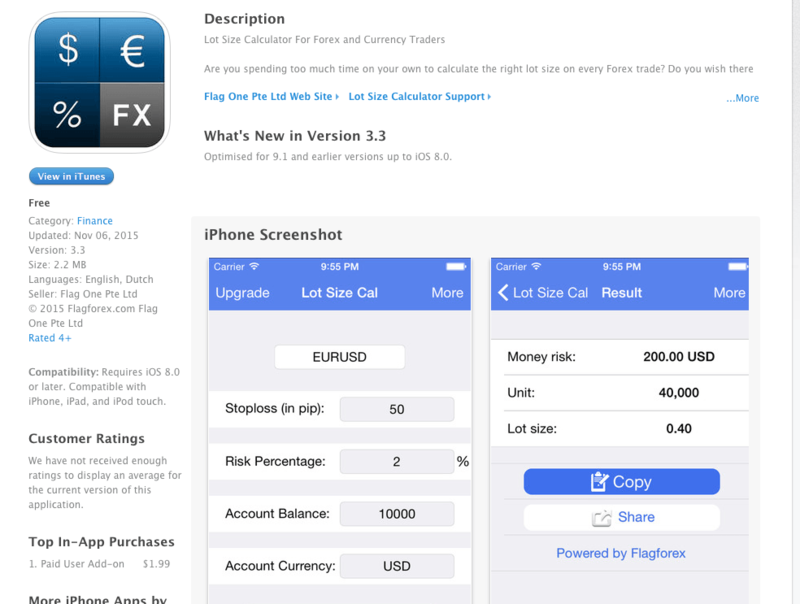 Sample Risk Calculator iPhone app.